All Supplies Provided! In the 18th and 19th century, Lover’s Eye Tokens were popular with the wealthy. A miniaturist painted just the eyes of a lover, preserving anonymity… thus the recipient alone knew the identity of the person depicted. The tokens were often elaborately decorated and worn as bracelets, brooches or pendants. Create your own version using a love token form, beads, pearls, rhinestones, and an eye portrait. Class fee, $45.00 + supply/kit fee of $25.00, which includes all necessary supplies; students will have a choice of materials and colors. Sizes of the eye tokens range between 2 in. x 21⁄8 in. to 3 in. x 2 in. Note: Although supplies are provided, feel free to bring in assorted beads, charms and embellishments from your stash to supplement or to add an even more personal touch. View a variety of tokens made by theresa mARTin on her pinterest board and visit her blog here and here for additional information and inspiring photos from previous sessions of this class. Categories: Blog | Tags: artistic artifacts, beads, lovers eye token, Mixed Media, paperwhimsy | Permalink. This is a digital collage from a while back. I shrunk it down to Artist Trading Card size, 2.5″ x 3.5″ and added some embellishments. I love the assembly line work of making little multiples. 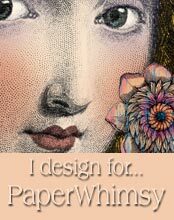 Categories: Blog | Tags: artist trading cards, ATC, Digital Collage | Permalink.